Callus is a bleak, seemingly hopeless sonic landscape. A massive bummer of an album in a year already pushing the bounds of reality in nearly every way imaginable. Much has happened in the six years since Gonjasufi’s Warp debut. Civil unrest, civil rights violations and open murder have become the norm. We have a major political party candidate running on a platform of hate, intolerance and wanton ignorance. Callus, his latest release for Warp, reflects this cultural shift to the extreme. Always skewing to the darkly psychedelic, here Gonjasufi abandons all pretense of hope and explores the world in which we currently reside for what it is. Taken at face value, we have simultaneously become callused by and to the civil unrest constantly transpiring around us. Where previous generations were presented with the horrors of intolerance and hate for an hour each evening, we now exist within a society under a constant onslaught of death and misery. Having been indoctrinated into a cultural conversation whose sole reason for being seems based on the journalistic principle of “if it bleeds, it leads", we as a society have become callused, virtually immune to the horrors that, less than a generation ago, would have sparked widespread outrage. Instead it is now de rigueur, the status quo, the expected norm. Gun violence is widespread, politics has become a hate-spewing reality show and there is now a need for an entire movement arguing in favor of the validity of the continued existence of an entire segment of the population. Callus is a claustrophobic, nightmarish collection that serves as an aural distillation of the current turbulence, interpersonal intolerance, hate culture, and general civil unrest through which we are all currently struggling. Glitchy, twitchy and covered in a sheen of grime, the sounds collected here are not designed to engender feelings of goodwill. Rather it serves as an aural mirror reflecting the current state of our society, one riddled with intolerance and seething with unmitigated hate and mistrust. Heavily dystopian in nature, Callus makes no effort to offer a false sense of security or indication that everything will work out in the end. Rather the main point seems to be that we are becoming the products of what we are putting forth. Without the love and acceptance needed for society to truly flourish, anger and hate will become the dominant cultural currency, a cancer on the country that shows no signs of abating. The title itself proves multifaceted, invoking its homonymic sibling, functioning as both commentary on how the majority of us respond to daily accounts of violence and death or as a personal philosophy employed to protect ourselves from the harsh reality with which we are faced each day. In either case, the idea of a callus or callousness sets the tone for the whole of the album. This is not easy listening, nor is it meant to be. Callus is confrontational and aggressively unapologetic in its approach. There are no silver linings, no moments of hope or reassurances that things will be okay. Throughout, his vocals sound literally phoned in from the ghost of a forgotten landline suffering from a lack of proper connection. This aesthetic approach makes a number of the lyrical nuances somewhat difficult to parse, but it conveys the feeling of the lyrics themselves perfectly. “I was never meant to be this fucked up,” he pleads on “Shakin Parasites", a sentiment that could well serve as the epitaph for an entire generation growing up in the shadow of hate and mistrust that has so permeated modern society. “Never feel safe where I can’t be myself / Never go outside…” reflects a sadly real fear for many young men and women currently trying to make their way. Titles like “Maniac Depressant", “The Kill", “Prints of Sin", “The Conspiracy", “Devils", “When I Die", and “Last Nightmare” show where Gonjasufi is mentally, inhabiting a space generally reserved for the more theatrical elements of black metal and its pale-faced practitioners. The album cover’s reverse negative of the three crosses representing Cavalry offer a visual representation of the twisted view of Christianity under which the current culture of intolerance operates. “Don’t let the church hypnotize you,” he intones on “The Jinx". You can’t espouse Christian platitudes while simultaneously spewing hate; it’s either one or the other, they do not go hand-in-hand. “In my dream last night I wasn’t afraid of you / ’cause in my past life I was a savior too.” This brief rejoinder is the sole message of hope throughout the whole of the album’s run time. Fittingly it comes at the very end of “Last Nightmare,” a perhaps fleeting indication that there is yet still hope for a reprieve. 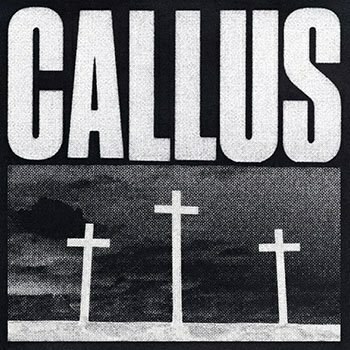 With Callus, Gonjasufi has crafted an aural equivalent of this modern era. It’s a bleak, often painful listen that does not engender a sense of hope for the future. In this, the commentary acts as something of a self-reflection in which we see ourselves as we truly are as a society. It’s unflinching, unapologetic and at times bordering on unlistenable. But it’s a bold sonic statement that brutally conveys its intended message. In this, Callus proves a success.